On Friday it was cloudy, cold and a little rainy. So when my parents went for a walk I stayed at the house and fed some birds. 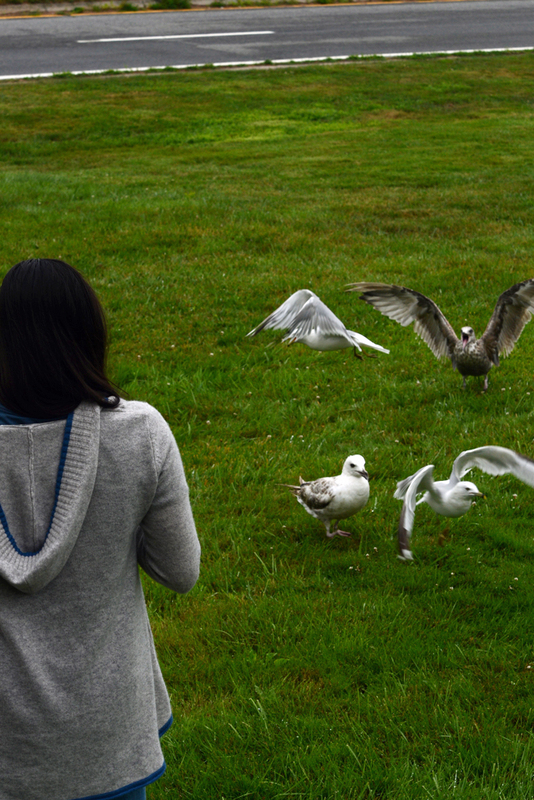 At first I was just throwing out bread, but seagulls started coming in so I decided to just sit in the (wet) grass and try to get a particularly chubby bird to eat from my hand. It took about 20 minutes and constant deleting of video on my camera to make more space for me to get him on film! My uncle was taking photos of me while all this happened and when finally we got it - video and the perfect photo of the bird eating from my hand. Thankfully my jeans weren't ruined by sitting in the wet grass, ha ha. That was quite ramble-y...anywhoooo, enjoy the photos and video below! Awww. How sweet is that?! How cute! I love that shot of the two robins. Glad your jeans didn't get grass stains! Lovely photos!!!!!!!!! I like it!!! Ahwww how cute.... i love to take time and just admire nature. Awww love these photos...so so cute! Right when I read the title of this post I thought of the song from Mary Poppins! Love the way the photos turned out. The bird that ate from your hand is so cute and chubby! You're a patient and gentle photographer - what pretty pics!